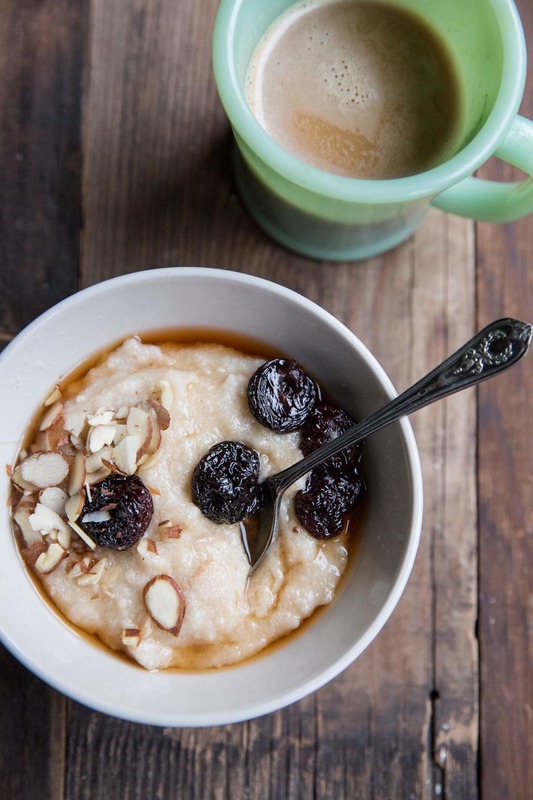 Farro is a perfect grain to make porridge out of. Farro Poridge may be my favorite winter breakfast. I wouldn’t say I’m a creature of habit but I do have several things that I stick by on a normal basis. Oatmeal and Winter go commonly together too. . Oatmeal has been getting me through the colder months for years and keeps me perfectly full until lunch. Every winter I change it up just slightly, last year it was more steel cut oats, and this year I’ve been making more porridge. Next year it will probably be some other form of warm oats and I’ll be equally as enthusiastic about my new addiction. Porridge is not something I grew up on. We had cereal most mornings and the occasional oatmeal in a packet but never porridge. It wasn’t until I was an adult that my mom served me cream of wheat. Though I owe much of my love for food and cooking to my mother, she doesn’t cook very often now. But upon a visit a few years ago, she did stir up some instant cream of wheat and there was something so comforting about it, maybe it was that my mom made it for me or that it was just perfectly sweet and creamy, but it just hit the spot. I definitely think there’s something magical about food that you’re mama serves. Now, I think Everett finds it perfectly comforting on a winter morning too. While I was growing up my mother served us so many comforting foods that I continue to cook now. Her chocolate pudding, eggs benedict with hollandaise sauce, lasagna, and french toast make regular rounds in our home today. Though I must say they are just not the same when I cook them! What are some foods that your mom cooks that are still comforting? I love hearing ideas of comforting foods to serve my little guy! Later this week I’ll be sharing more of my favorite winter-time breakfasts so stay tuned! 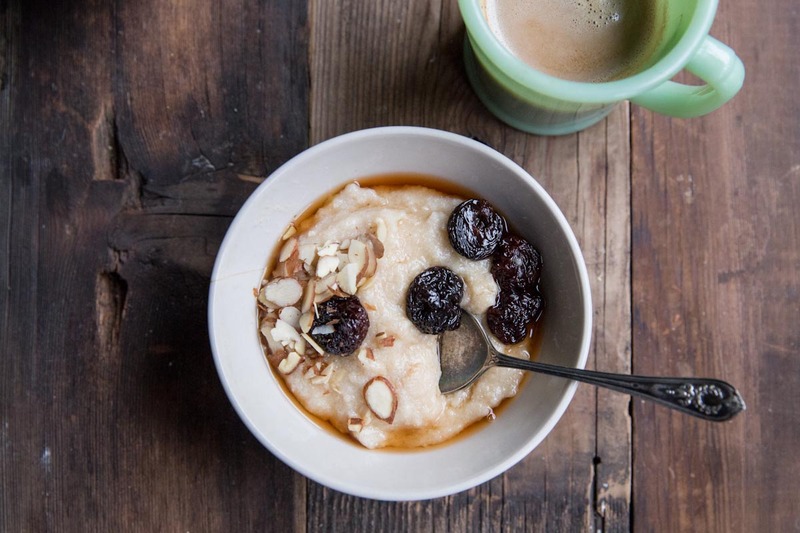 An comforting and healthy breakfast of farro porridge topped with brown sugar soaked cherries and almonds. Using a high powered blender or food processor grind the farro until it becomes a powder. Using a medium saucepan, bring 1 cup of water to a boil. Slowly sprinkle the farro powder over the boiling water, whisking to combine. Turn heat down to a medium low simmer and continue to whisk for 10 minutes. In a separate small saucepan over medium heat, add in cherries, brown sugar and 1/4 cup water. Bring to a simmer and cook until sugar is dissolved (about 2 minutes). When the farro is about 2 minutes from being done add in the almond milk. 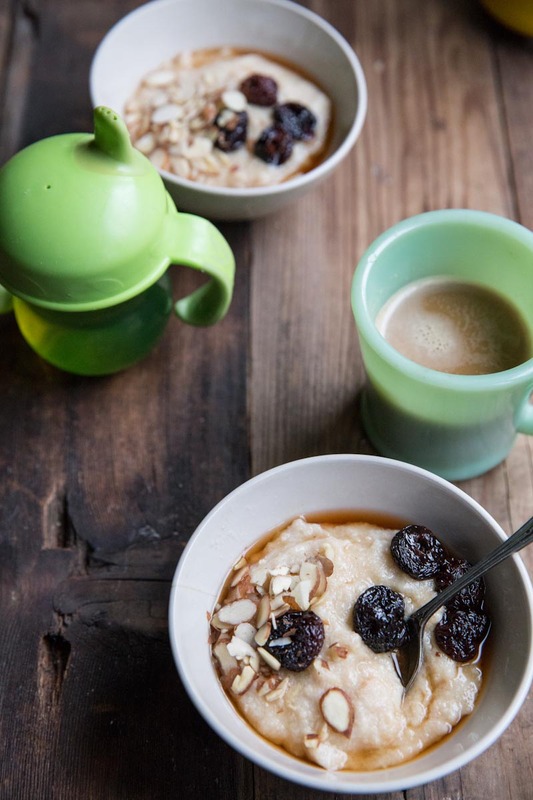 Divide the porridge into two bowls then spoon the cherries and some of the brown sugar syrup over the top. Sprinkle with almonds and enjoy! If you can't find farro, try wheat berries, kamut, or pearled barley. You can also combine several grains like amaranth, millet, brown rice, and steel cut oats. 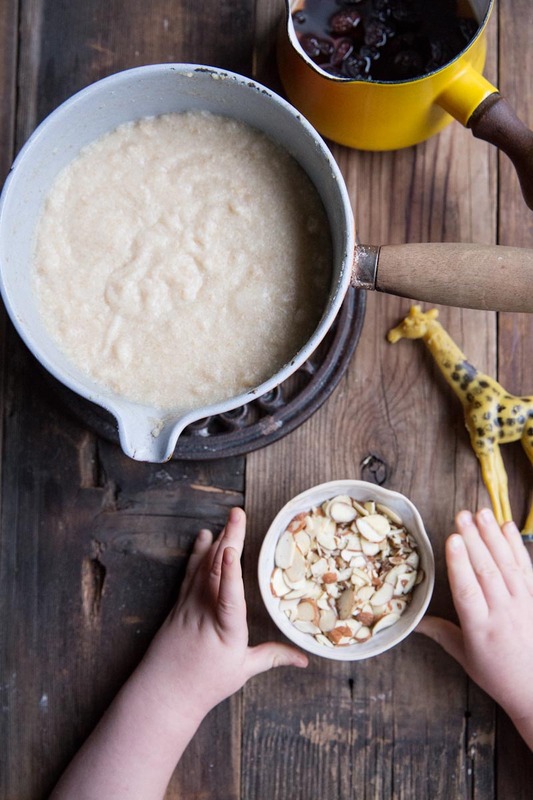 The key for porridge is to grind them into a flour before cooking them. I think this IS my favorite wintertime breakfast! Just received my chicory candle from Produce. LOVE IT!!!!! Thanks, Becky! So glad to see ancient grains and seed used ! Thank you so much !